The following article appeared in Dominica News Online, in it homage is passed to musical icon Jeff Joseph who passed away on Wed. Oct. 24, 2011. Culture Minister Justina Charles said Dominica’s Goodwill Ambassador and cultural icon Jeff Joseph should be remembered as a National Hero. Jeff Jo died at a Martinique hospital on Wednesday following two major surgeries. “It has been a shock and it’s a sad occasion for the people of Dominica. As a musician and cultural icon he has inspired many people in Dominica and even Martinique and Guadeloupe. His contribution to the development of Creole music and Cadance-lypso is particularly most phenomenal. His talents his dedication and perseverance have yielded legendary hit songs over a period of three decades. We know that he dedicated his whole life to music. Through his music he promoted love, togetherness, Caribbean unity while remaining true to his Dominican culture,” she said. According to Charles, when he performed at the last WCMF, no one knew that would have been his last performance. “We know we have lost a patriotic son, a cultural icon and a hero,” she said. Meantime Dublin Prince has added her voice to the number of Dominicans expressing sympathy to the family. “When he was in Dominica for the WCMF, I never thought that this would be the last hug I was getting from Jeff. We have lost an icon. We will miss him because the country has lost an icon. 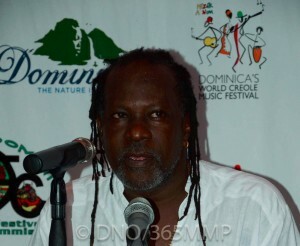 He has taken Dominica to the highest level in terms of Cadance music,” she explained. She said the Dominican people should never forget a man like Jeff Jo. “The people of the west coast should always remember him too. The young artist should take a leaf from his music because he was a true ambassador,” she said. “A singer of cadence-lypso, Jeff Joseph has re-established our links and connections to the Caribbean,” she said. Condolences had been pouring in after reports of the passing of the musical icon yesterday. Events Director of the Dominica Festivals Committee Nathalie Clarke-Meade said she will remember Joseph, popularly known as Jeff Jo, for expanding her knowledge of Creole. “He was such an energy. He taught me all I know about the history of Creole,” she said emotionally. Jeff Jo, of St. Joseph, has been known for marketing the World Creole Music Festival in Martinique and Guadeloupe. His colleague Leroy Wadix Charles said Jo’s death will signify a tough time for those who have worked to preserve the Creole language. “There was a time when people didn’t want Creole spoken on the radio. Many cadence-lypso songs came out in the Creole language and many different messages were in those songs,” he said. Jeff Jo was on life support at the intensive care unit of a Martinique hospital. His family confirmed he had been unconscious since Tuesday and was taken off life support about 2 p.m. on Wednesday. He died around 2:30 pm. Prime Minister Roosevelt Skerrit has described Jeff Jo as a true ambassador to Dominica, and said his death has left Dominica in shock. Parliamentary representative for St. Joseph Kelvar Darroux has also expressed sympathies. Fans of Jeff Jo here and overseas have been sharing their thoughts of the artist on radio. The Grammacks New Generation artist performed at the 15th World Creole Music Festival this year. Jeff Joseph was born in the village of St. Joseph and his musical career began around 1972 in Guadeloupe. From that base he has toured the world with a focus on the Antilles. Many of his classic recordings were done in the legendary Debs Studio in Martinique and he had added various Caribbean styles to his musical identity. Not only was Jeff a lead member of the original Gramacks, the follow up Gramacks International, but he was also a founding member of the Antillean group Volt Face along with Georges Decimus. For the original posting: UPDATE: Jeff Joseph should be remembered as a National Hero – Culture Minister | Dominica News Online. The following article was written by Nelson A. King and published in Caribbean Life on Nov. 9, 2011. The board of directors of the Bronx, N.Y.-based Garifuna Coalition, U.S.A, say they will honor Erline Williams-King, a former aide to the St. Vincent and the Grenadines New York Consul General, at its “Fourth Annual Yellow, White, Black Garifuna Settlement Day 2011” fundraising gala on Nov. 19. Williams-King will be recognized for her “support of the renaissance of the Garifuna Heritage and Culture in St. Vincent and the Grenadines, at The Eastwood Manor, 3371 Eastchester Rd., the Bronx. The coalition said that although Williams-King was born in St. Vincent and the Grenadines (‘Yurumein,’ the ancestral homeland of the Garifuna people), she can be “classified as a Caribbean woman, having lived in Carriacou, Grenada, Barbados, Jamaica, Montserrat, Nevis and her homeland, St. Vincent and the Grenadines. “Ms. Williams-King, a social worker by profession, has always been involved in community service and is very passionate about the welfare of her fellow brothers and sisters,” it said. “She has been a high school teacher, guidance counselor and mentor to many. “Her record of humanitarian achievements is best highlighted by her involvement in many organizations and committees,” it added, stating that Williams-King, who was a founding member of Hearts and Hands for Nevis, Inc., worked “assiduously” to ensure that the goals and objectives of the organization were maintained. Photo: Courtesy Bajun Sun Online. Williams-King, who retired from her substantive position at the consulate, at the end of August, is also a very active member of the Brooklyn-based Caribbean-American Renal Failure Relief Fund Steering Committee, where she performs the duties of secretary. This committee assists Vincentians who come to the United States seeking medical attention for renal failure. “Ms. Williams-King has a penchant for all things cultural, and she is always willing to learn about the many cultural practices of different countries and peoples,” the Garifuna Coalition said. “She enjoys the dancing, singing and cuisine of the various countries, and never misses an opportunity to be involved and to learn,” it added. The group said Williams-King first became aware of the Garifunas when she migrated to the United States, and has since embraced their culture. Williams-King enjoys singing and has been featured in many concerts in St. Vincent and the Grenadines, Jamaica, Barbados and the United States. She is currently a member of The Roy Prescod Chorale and her church choir, at St. Mark’s United Methodist Church, both in Brooklyn. “The Garifuna Coalition Inc. is an organization that I have always held in high esteem,” Williams-King told Caribbean Life. “When I became aware of its existence, and after attending some of their functions, I realized that they were a people with a mission. I was totally fascinated with their commitment and how resolute they were to ensure that they kept their culture alive, in their language, cuisine and practices, from the elders to the youth,” she added. “To be honored by this organization, for which I have the greatest respect and admiration, is truly humbling,” Williams-King continued. “I deem it a privilege to be associated with this organization and to be even considered for this recognition,” she said. In recent years, the local Garifuna group, COSAGO and former U.S. Ambassador Ellsworth John were among St. Vincent and the Grenadines’ groups and individuals honored by the Garifuna Coalition, U.S.A. Inc.
For original report: New York Garifuna group honors a compatriot • Caribbean Life. Time: 9:00 a.m. – 9:30 p.m.
On Saturday, November 12th, Indiana University Bloomington will host the conference Why We Sing: Indianapolis Gospel Music in Church, Community and Industry. 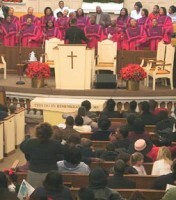 Why We Sing is a one-day conference which explores how the city of Indianapolis has served to inform, enrich and distribute this uniquely African American religious music expression both locally and globally. The conference will consist of three roundtable discussions featuring eight prominent Indianapolis gospel music icons: Al “The Bishop” Hobbs (Aleho Records, former Chair and current board member of the Gospel Music Workshop of America); Dr. Leonard Scott (Tyscot Records); recording artists Lamar Campbell, Rev. A. Thomas Hill, and Rodnie Bryant; Liz “Faith” Dixson (Radio Announcer, WTLC AM 1310); Tracy Williamson (TRE7, Inc. Artist Development, Marketing and Production Company), and Sherri Garrison (Director of Worship, Eastern Star Church; Former Director, Gospel Music Workshop of America Women of Worship). Doors for the conference open at 9:00 am at the Indiana University, Neal-Marshall Black Culture Center. The conference will culminate with an evening concert emceed by Al “The Bishop” Hobbs starting at 7:30 pm at the Fairview United Methodist Church. Performers include Sherri Garrison, who will be directing the Bloomington Community Chorus, and recording artists Rodnie Bryant and Lamar Campbell. All events are free and open to the public. A related exhibit in the Neal-Marshall Center’s Bridgwaters Lounge is open to the public through mid-December and features biographies of the participating artists as well as recordings, photographs, and other memorabilia from the Archives of African American Music and Culture. The conference, concert, and exhibit have been organized by Dr. Mellonee Burnim, Raynetta Wiggins, and Tyron Cooper of the Department of Folklore and Ethnomusicology and the Archives of African American Music and Culture at Indiana University Bloomington. For more information, visit the conference website. For original posting: WHY WE SING | blackgrooves.org. The following report was published on the website Spiceislander.com, Nov. 7th, 2011. It is with deepest regret and enormous sorrow that the Carriacou Parang Festival Committee learnt of the sudden departure from this world, of the leader of “Men from the Mainland Parang Band ~ Anthony “Jericho” Greenidge ~ on Thursday 3rd November, 2011. Jericho was an incredibly talented cultural minded individual who has made significant and priceless contributions to the development of the Carriacou Parang Festival over the years. Jericho first became involved in the festival as an MC more than 20 years ago, however his involvement didn’t stop there; as an announcer and cultural enthusiast, Jericho was the “main man” for voicing the radio commercials to promote festival. Jericho was also instrumental in organising the very first and only parang band from the mainland Grenada to participate in the annual Carriacou Parang festival, thus bringing an added dimension to the festival. Throughout the many years Jericho was always available to assist the committee at a moment’s notice with no condition whatsoever attached. He also used part of his time on radio to promote the festival to audiences both at home and abroad. As we struggle to come to terms with Jericho’s sudden passing, our hearts go out to his family, friends and colleagues; especially the members of the Men from Mainland parang band. Jericho was an important presence in so many people’s lives and he will be sadly missed by all of us. 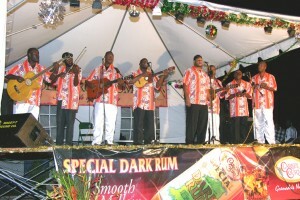 For original report: Spiceislander.com » Carriacou Parang Festival Committee pays tribute to Anthony “Jericho” Greenidge.